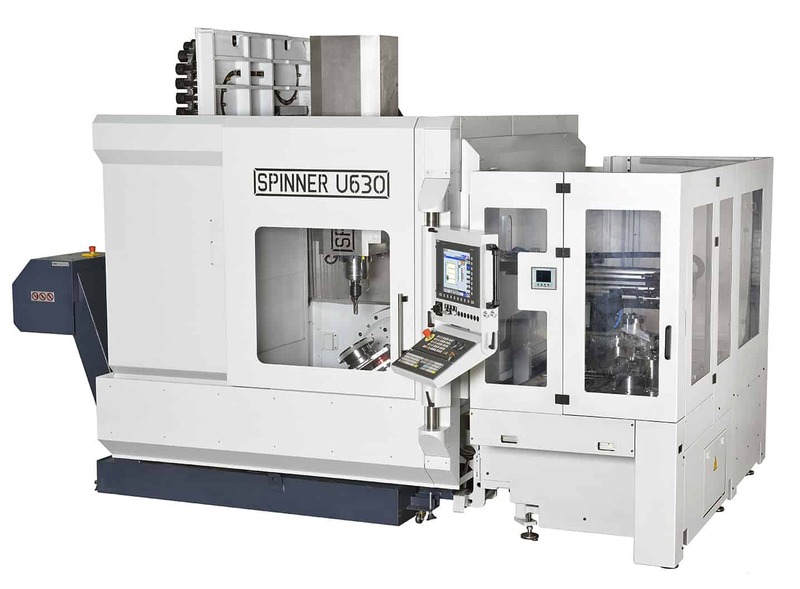 The U-630 and U-1530 ranges of 3-, 4- and 5-axis vertical machining centres (VMCs) from German manufacturer, Spinner, have been significantly uprated in response to suggestions from end users. Sole sales and service agent for the UK and Ireland, Whitehouse Machine Tools, explains the improvements. Called U-Advanced Series, the machines offer larger magazines up to 122 pockets for SK40 / BT40 or HSK63 taper tools, higher speed spindles with maxima of 12,000, 15,000 or 20,000 rpm, longer axis travels, higher coolant pressure to 70 bar, improved chip flow and a swarf conveyor as standard. CNC options are the most modern versions of Siemens (840D sl 4.x) and Heidenhain (TNC620 / TNC640) controls, both with 15” screen. For operator convenience, the height and angle of the control can be adjusted. Digital drives from the same two manufacturers ensure high precision machining, with linear scales fitted for accurate feedback of axis position. Despite the longer strokes, now 630 x 530 x 465 mm for the U-630 and 1,530 x 530 x 465 mm for the U-1530, the footprints of the machines have been reduced to enable installation in smaller workshops. Furthermore, the overall height is lower, facilitating access to factories. U3 machine variants are 3-axis VMCs with a fixed table. Built into the base of U4 models is a larger, more dynamic, rigid rotary table that pivots around a horizontal axis to allow workpieces to be clamped on both faces. For full 5-axis machining, U5 versions have an integrated rotary-tilt table that can optionally be equipped with a counterbalancing system to eliminate the influence of workpiece weight. Direct-drive rotary tables are available. Low-cost automation is offered in the form of a 5- or 9-pallet pool with automatic pallet exchange. Positioned to the right of the machine, the configuration is said to be particularly well suited to mould making. Alternative automation arrangements accommodate up to 50 pallets. Whitehouse Machine Tools advises that more than 1,000 of the original U-Series VMCs have been installed and that U-Advanced Series sales in Germany already exceed 50 units. A U5-1530 is available for demonstration in the agent’s Kenilworth showroom. It is also noteworthy that the new machine range is complemented by the entry-level Compact Series of 5-axis VMCs from Spinner, intended for up to 4-axis simultaneous cycles.